Figure 1. 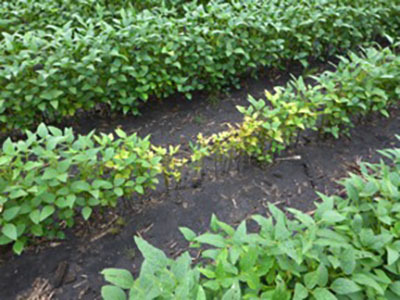 Yellow patches of sudden death syndrome in a soybean field. Leaves of infected plants can fall off but petioles will stay attached to the plant. Brown stem rot (BSR). This disease is still mostly only in northern Iowa but has also been reported in parts of eastern Iowa. Remember to split stems to distinguish between SDS and BSR. 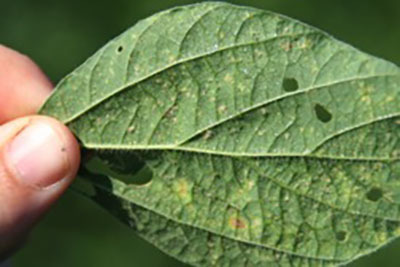 This article from earlier in the season explains more about how to tell SDS from BSR, as well as discusses BSR management issues. 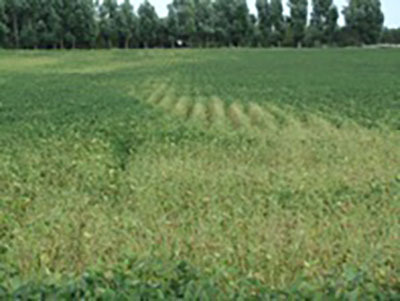 While the cause of top dieback is unknown, many yellow spots in fields are the result this disease. Top dieback appears as yellowing on the outside margins of leaves in the upper canopy (much like potassium deficiency, but in the upper canopy). The cause of this disease is still up for debate, but potassium deficiency, SCN, and the Phomopsis/Diaporthe disease complex (fungi associated with stem canker and pod and stem blight) may be culprits. Several years ago, a very thorough article was written about top dieback. This foliar disease is becoming more common as the season goes on. Downy mildew can be identified by the light green, irregular shaped lesions on the top side of the leaf and fluffy white growth on the under side of the leaf (Figure 2). Figure 2. Fluffy white growth on the leaf underside is a sign of downy mildew infection. Another foliar disease that is showing up in parts of Iowa, especially in the southern counties, is frogeye leaf spot. Frogeye is fairly easy to identify by the gray lesions with purple borders. There have been a few isolated reports of stem canker, which is another disease that is more common after very wet springs. Look for distinct lesions on the stem to identify this disease (Figure 3). Figure 3. Stem canker can be identified by examining stems for sunken, gray-brown lesions with reddish margins. Note green tissue below lesions. Photo courtesy Craig Grau. There have been reports of white mold across most of Iowa; however, most cases have been fairly low incidence of the disease. Additional information on white can be found in this article. Other diseases seen in Iowa include Septoria brown spot and bacterial blight (both have been around for most of the growing season), soybean vein necrosis virus (SVNV) in southeast Iowa, and possibly soybean dwarf virus (Figure 4). 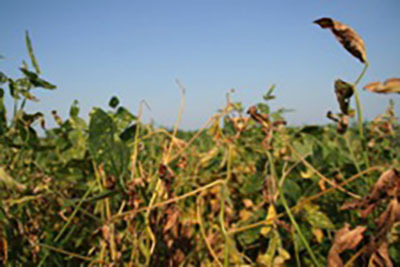 Many soybean diseases have similar symptoms to other diseases. If diagnosis is proving to be difficult, samples can be submitted to the Plant and Insect Diagnostic Clinic at Iowa State University. See this article for instructions on how to do so. Figure 4. 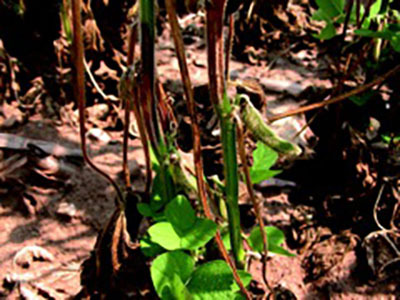 Possible symptoms of soybean dwarf virus. Samples are being tested for confirmation that this virus is the cause. Daren Mueller is an assistant professor in the Department of Plant Pathology and Microbiology; he can be reached at dsmuelle@iastate.edu or (515) 460-8000. Tristan Mueller is the Operations Manager for Iowa Soybean Association's On-Farm Network and can be reached at tmueller@iasoybeans.com. or (515) 334-1075. Links to this article are strongly encouraged, and this article may be republished without further permission if published as written and if credit is given to the author, Integrated Crop Management News, and Iowa State University Extension and Outreach. If this article is to be used in any other manner, permission from the author is required. This article was originally published on August 29, 2014. The information contained within may not be the most current and accurate depending on when it is accessed. Subscribe to receive email alerts when new information is posted.